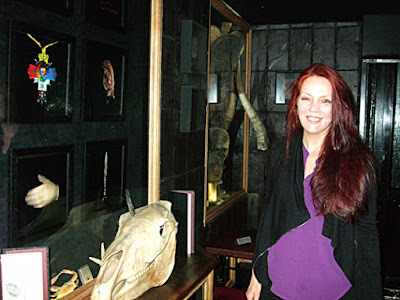 Last night I went to a wonderful party at the Viktor Wynd's Museum of Curiosities in London to celebrate the exhibition of photographs by Sara Hannant of items from the Museum of Witchcraft and Magic. The picture above is one I took of Sara standing by a display case of some of her work and items from the MWM's collection. Sara is such a brilliant photographer that I always feel a little bit embarrassed when I take pictures myself around her, because I know I don't have anything like her level of skill. I really do recommend going to the exhibition if you haven't done so already to see her amazing photographs. They are all also printed in the book Of Shadows, by Sara and Simon Costin. The exhibition also includes some fascinating magical items including a wax curse poppet, a witch mirror, spells and charms. You can read my review of Of Shadows here: http://www.badwitch.co.uk/2016/10/of-shadows-objects-from-museum-of.html and you can view Of Shadows on Amazon.